Here are just a few of the services we can provide you. Don't see what you need? Call us or use the contact us page. You won't be dispointed. Need some painting? 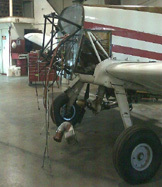 Hinman Aviation can handle that for you as well. Before and after view of another satisfied customer. Full pilot services, we can transport your plane back home for you or to wherever you wish. Not only do we provide you a full maintenance service, but we go the extra distance and send you pilot reminders via email, text message, or a phone call.